Shielded RJ45 female to female field installable coupler, simply plug a patch cord into either end and screw together. Compatible with existing hardware, can be panel mounted. 1" - 20 UNEF (Unified Extra Fine Thread) outer threading. Use the included nut for panel mounting. Circular threaded coupling assembles in-line to connect two patch cords together. CAT5/5e/6/6a shielded cable with a 6mm-7mm O.D. is required for waterproofing. Temperature range: -4 to 176°F (-20 to 80°C). Power over Ethernet (POE) voltage rating: 60W. "CAT5E-WTP-FF is one of the best couplers we have found that works for our IP network cameras. It is waterproof and eliminates shorting out the circuits. That is why we continue to use it." 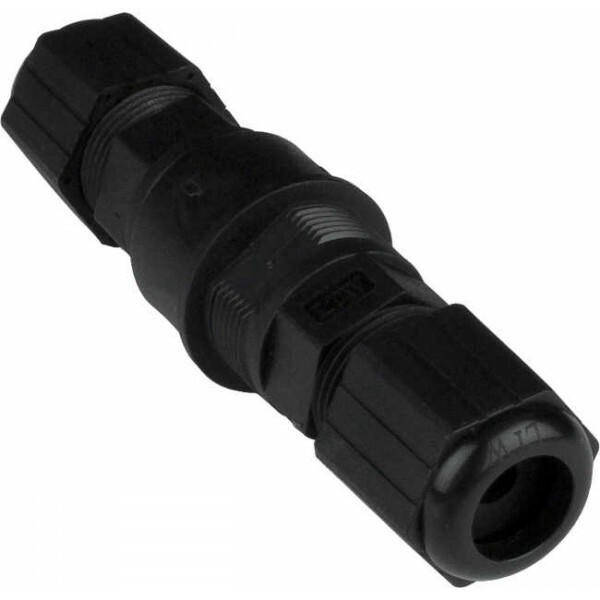 "I was able to use the CAT5E-WTP-FF coupler to get a network connection for my boat when I am at dock. This unit keeps the water out and the cable protected." "VPI's CAT5E-WTP-FF is a great solution for me to connect two cables together and keep water out."